The theme for LaPiS this week is SQUARE. As I was looking through my food photos and saw this pork roast with the square pieces of crunch on top and decided that it’s time to re-post the recipe. Here is what we make when we have hankering for some lechon. Heat oven to 400 degrees F. Rinse the pork and dry well. Score the skin but try not to cut too deeply. If you cut into the meat, you’ll end up with juice ‘runs’ on your cracklings. So try to cut only skin deep. On the underside of the roast where there is no skin, make several slits in the meat where you can insert the pieces of garlic. In a small bowl, combine the salt and pepper flakes then rub the mixture all over the roast. Place the roast in a roasting pan, skin side up, and pour one cup of water into the pan. Place the pan in the oven and set the timer for 30 minutes. After a 30 minute blast at 400 degrees F, turn the oven temperature down to 300 degrees F.
Go get a good book and a glass of wine and stay out of the kitchen for at least 5 hours. Sound good? By the time you finish your book, you’ll have a roast so tender that you can practically pull the bone out without cutting the meat. And those cracklings? hmmmm hmmm good! You’ll just have to try it to see how good it is. The secret is the long roasting time on low temperature so do this when you have some time to let it get good and juicy. Yes, the meat stays moist and juicy, having basted itself with its own fat. yumm! This SQUARE entry doesn’t really make you all that ‘hip’, but it sure would make you ‘hippy’ if you eat enough of it! 😛 Visit other SQUARE entries to this week’s LaPiS! Oh my!!! I have to try this! This will certainly make me moan like a kitten 🙂 I am drooling all over my laptop with the photo! That looks fantastic! I’ve recently gone back to being mostly vegetarian, but I think that would tempt me as a cheat. My family would devour it. I will rush to the grocery to get me a big hunk of skin-on pork shoulder. oh wow! gotta try this. 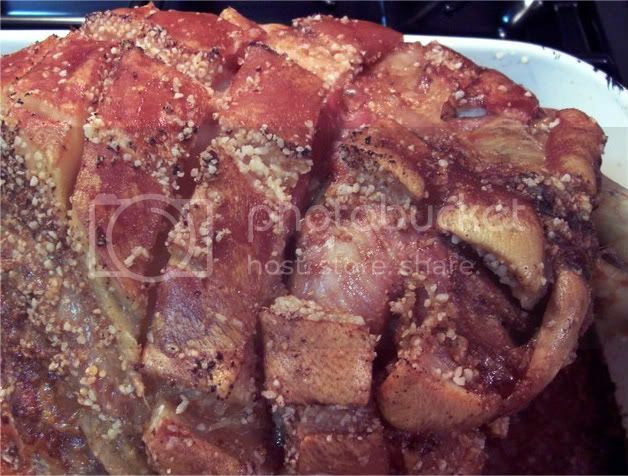 my kids will love this; it is so much like lechon kawali which they like. foto is so good, gusto kong kagatin! thanks for the recipe. crunch crunch. YUM YUM. love crispy skin and tender, juicy meat 🙂 thanks for the tip! I have enough calorie overload for this week’s Lapis lol…Square squares! My mom in law makes this too! Hi CeS! Yep, that’s PurpleGirl’s lechon that I kind of tweaked a little but not by much. OMG, crispy pata!!! if I wasn’t so afraid of frying large chunks of meat, I’d be making that too. lol! oooh! i want one now!!! what M does is sort of like Chloe’s, only he fries the pata[for crispy pata] after boiling and broiling! nyamnyam!! !